For an energy efficient residential sauna you need to start with a high quality heater stove that is properly rated for the size of your sauna room. In addition to reaching every spot in the sauna, you’ll want your sauna to heat up to temperature as fast as possible - and the heat to stay constant until you are finished. You’ll find commercial and residential heaters on the market, a lot of them in fact, but you should take a look at Saunacore sauna heaters for outstanding quality and price. 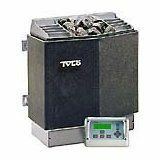 These units are energy efficient and service-free sauna heaters, ranging in models from 2,000 watts to 21,000 watts, with various compact sizes available. All of the residential heaters are manufactured to meet the latest CSA, UL and CE safety requirements. Note: These are the economically-priced sauna heaters; Saunacore also offers special edition residential heaters, steam vaporizers and the Ultimate Heater (all starting at around $600). We are also impressed with the features of the Saunacore standard residential sauna heaters which include mechanical wall mount controls, sauna stones, stainless steel construction, wall mount design (corner or flat), and ultra long life Incoloy heating elements (more durable than copper or stainless steel elements). They also feature a heat deflector surrounding the rock tray to direct heat into room (others heat upwards over the heater) and a vented body design which allows the sauna heater to run up to 50 degrees cooler than competitors. The underside of the heater is open to allow cold air at floor level to pass through the hot rock compartment, creating air convection throughout a sauna. The sauna heaters automatically shut off after 30 minutes but may be set for up to 60 minutes. 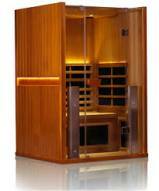 Saunacore is a leader in the industry and much respected for its heaters and sauna designs. 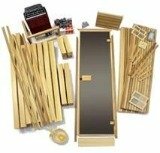 As you can see from the specs listed above, with Saunacore products you’ll be getting a residential sauna heater that is well-built and backed by an extensive warranty. What About the Saunacore Saunas? Just like their heaters, the Saunacore Saunas themselves are top of the line in every way. Unlike many of the companies you find online who are simply resellers, they actually manufacture their own products. 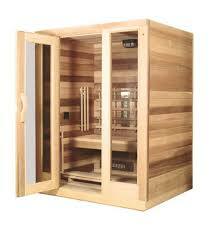 They offer a full line of infrared saunas, traditional units, outdoor models, and do it yourself/custom kits. And all are the highest quality in the industry. The most appealing thing about Saunacore Saunas is the sheer amount of in-depth information they provide about each and every one of their products. You simply do not find this kind of transparency anywhere else in the industry. 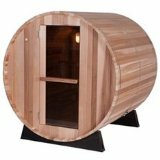 They have an 84 page product catalog that explains everything you need to do about each offering, and you can quickly see why they are one of the best sauna companies on the market today. Saunacore offers something for everyone, e.g. the Infra-Core Premium is the most advanced infrared sauna you can buy; the Horizon Purity line is medical grade and caters to those with chemical sensitivities; the Finn-Core line is an affordable way to get a great IR sauna without spending a fortune. Everything is manufactured in Canada and the company has been around for almost 40 years. There is real science behind the design of their heating elements and saunas, thus allowing you to reap the most amount of health benefits.